Video: Slow motion homage to Group B rally reminisces "The Days of Madness"
YouTube rally video maven, Amjayes, has released a new tribute video. Titled "Group B Monsters - The Days of Madness," the video is an artistic, slow motion compilation of clips showcasing the glory days of Group B rally racing. As noted in the video's introduction, 4-time World Rally Champion, Juha Kankkunen may have said it best: "WRC is for boys. Group B was for men." 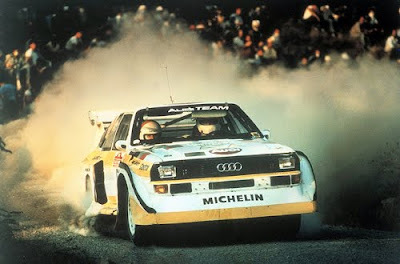 And of course, the video features plenty of footage of Audi's venerable Group B quattro monsters. Perhaps the only down side of the video is the soundtrack. While the chosen music is perfectly suited to the film's emotionally charged imagery; not one rev, chirp or wastegate whistle can be heard. So, to fill the void, we've attached another video from Amjayes, appropriately titled "pure engine sounds."